A guest post from Dr Helen Bridle, Royal Academy of Engineering and EPSRC Fellow at Heriot-Watt University. Her blog can be found here. 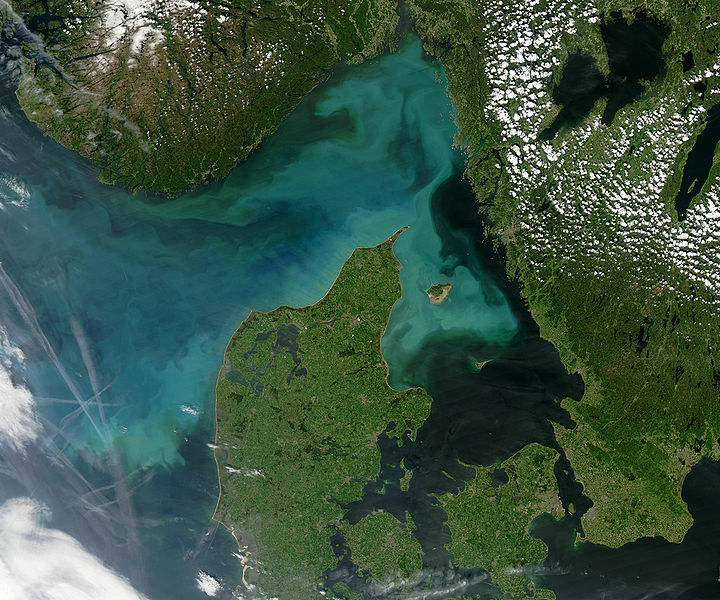 Algal bloom off the coast of Denmark. several critical roles in the functioning of the oceans, both good and bad. However, without accurate tools to detect them, understanding their function and behaviour is challenging. A major negative impact is the formation of harmful algal blooms, which produce toxins dangerous to both humans and sea life. With climate change, the frequency of these blooms is increasing. This effect is most prominent in the North Sea and the Mediterranean. Bloom conditions occur when phytoplankton grow excessively. Certain species of these microbes release harmful toxins which can kill sea birds as well as dolphins, whales and other marine mammals. Toxin-contaminated shellfish have also poisoned humans. Existing methods of detection offer insufficient detail and in some cases cannot distinguish between harmful and non-harmful blooms. Dr Matthew Mowlem and Professor Hywel Morgan, from Southampton University, have made significant progress towards a hand-held rapid detection system to provide early warning of blooms. By regular monitoring of the toxin releasing species trends in population growth can be picked up to offer advanced warning of a harmful bloom. Early warning increases the options for managing these events. How do phytoplankton impact on CO2 levels? The new detection system is also useful to study more about the beneficial roles phytoplankton play, for example in climate regulation and carbon capture. Like plants, phytoplankton photosynthesise, using light and carbon dioxide for energy. This removal of carbon dioxide from the atmosphere counteracts the greenhouse effect. Blooms of some species could therefore be very beneficial for the environment, capturing large volumes of carbon dioxide. 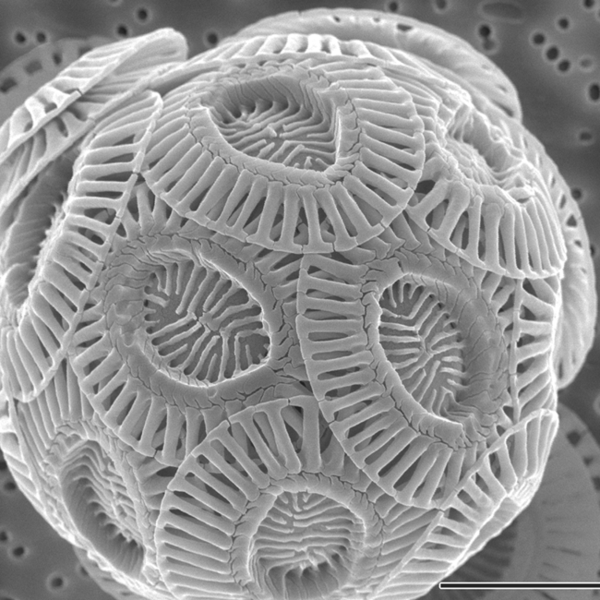 For example, a phytoplankton species known as coccolithophores are responsible for the majority of the carbon deposited as chalk across Europe, including the white cliffs of Dover. How does the detection system work? The new detection technology uses specific RNA sequences to determine the number and species of phytoplankton present in a sample of ocean water. For every test a disposable credit-card sized chip is inserted into a portable detection system. The chip makes multiple copies of RNA samples extracted from the phytoplankton which are then compared to known sequences from particular species. If a match occurs the binding of the phytoplankton RNA to a reporter chemical switches it to a state where light is emitted. As each reporter chemical, known as a molecular beacon, can be designed to emit light of different colours, this approach thus identifies what species are present in a sample. The major challenge in the project was being able to accurately work out from the detected light signal what the original concentration of the microbe species was. This was achieved by including in every chip a known quantity of an RNA segment to act as a calibration control. So far the sensitivity of the detection system is at a level where 1,750 cells in a thousandth of a litre can be detected. In algal blooms concentrations of the harmful species can reach over 1 million cells per litre, though damaging levels of toxins are released even when there are 1000 cells per litre, the equivalent of just one cell per thousandth of a litre. The trick to reaching the required detection limits is to combine the credit-card sized detection chip with a sample concentrating unit. This filtration system processes 2.5 litres of seawater delivering a highly concentrated sample for detection. Rapid, portable testing systems such as this new device provide the ability to generate large quantities of data about the number and type of phytoplankton present in the ocean, and follow changes over time, increasing our understanding of these tiny ocean microbes and the important roles they play in the functioning of our oceans. Tags: climate change, environment, geology, water. Bookmark the permalink.